Ethan Wallis (left, with Mike Reed) was chosen as the Edward Jones Investments Athlete of the Month for October for Cedarville High School. This award is being sponsored by the office of Mike Reed at Edward Jones Investments of Xenia, serving Xenia, Jamestown, Cedarville and surrounding areas. Wallis, a freshman on the cross country team, was second in the Ohio Heritage Conference, sixth at the district cross country meet, sixth in the regional and 24th in state, and was named the division’s all-state top freshman. He is a talented athlete with a positive attitude and grade-point average over 3.5. Photo courtesy of Ron Lea. 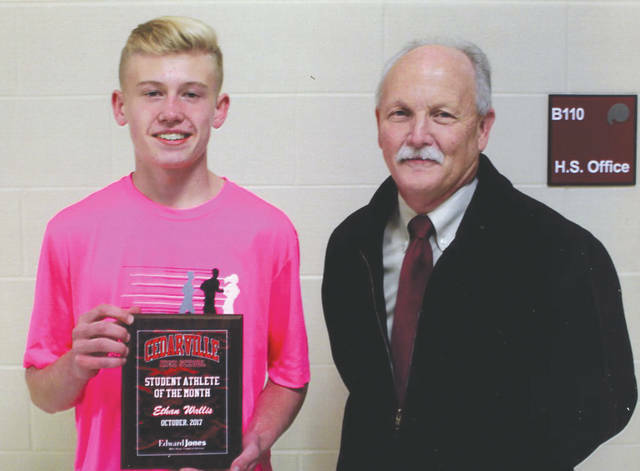 https://www.fairborndailyherald.com/wp-content/uploads/sites/50/2017/12/web1_EthanWallis_PS.jpgEthan Wallis (left, with Mike Reed) was chosen as the Edward Jones Investments Athlete of the Month for October for Cedarville High School. This award is being sponsored by the office of Mike Reed at Edward Jones Investments of Xenia, serving Xenia, Jamestown, Cedarville and surrounding areas. Wallis, a freshman on the cross country team, was second in the Ohio Heritage Conference, sixth at the district cross country meet, sixth in the regional and 24th in state, and was named the division’s all-state top freshman. He is a talented athlete with a positive attitude and grade-point average over 3.5. Photo courtesy of Ron Lea.